A delightful baby cardigan to knit quickly with a soft, chunky cotton/acrylic yarn and size 10-1/2 knitting needles. A great gift for a newborn. Ideal for the advanced beginning knitter. Finished with four 3/4" diameter pearl buttons. 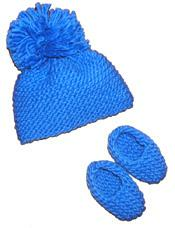 Knit on size 10-1/2 knitting needles (circular needles, 32-47" long are recommended).